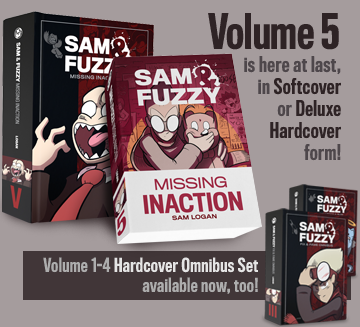 Sam and Fuzzy Q & A: When Edition Got a question you want answered? Just drop me an email with "Q & A" in the subject line! Well, Deathmøle does have one pretty big advantage, in that the music actually exists! Noosehead, on the other hand, is as good as you imagine them to be. I personally always pictured them as a loud-yet-commercially-appealing nu-metal act, which doesn't necessarily bode well for the quality of the music. But maybe that's not what they sound like at all. For the true answer, LOOK INSIDE YOUR HEART. It can be really hard to let old characters go -- especially the ones I really like! But in a story-driven comic, it happens. In some cases, like Sidney, the character reaches the end of a very definitive character arc, and I just don't have much else to say about them, so I don't mind letting them go. In other cases, I do miss working with them and really want to revisit them, but they don't have a logical role in the current story. Gertrude is one of my favourite characters, so she's a good example of that. It was really nice to finally bring her back last volume! But I'm glad I didn't try to cram her in earlier. 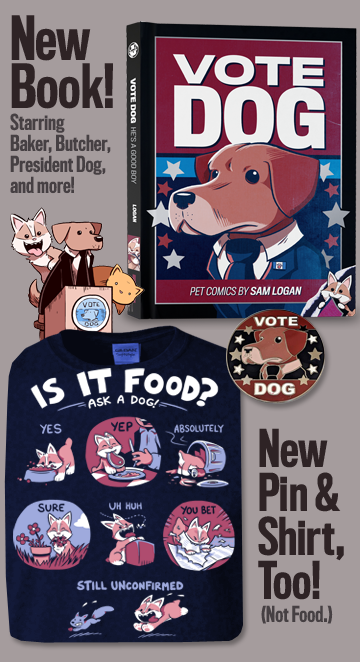 Sam and Fuzzy Q & A: Fav Edition Got a question you want answered? Just drop me an email with "Q & A" in the subject line! My first convention of the season arrives next week. It's Gottacon, in my old hometown of Victoria, BC. Like last year, I'll be in the exhibitor's area with my pal Alina from Weregeek, and we'll have a wide array of fun swag n offer. We'll also be doing plenty of original drawings and commissions, and signing whatever you stick in front of us. So if you're going to be at the show, come on by! A good chunk of the Sketch Off pin-up originals have already been scooped up, but there are still a decent number available if you're interested! You can have a look at 'em all in the gallery here. I've also added a bunch of new custom commissions and newly-coloured pieces to the gallery, too, that were drawn after the Sketch-Off was over. Those ones were all pre-purchased drawings, so you can't nab 'em yourself, but you can still look at 'em, at least! In other news, have you been keeping up with Tower of Babel? Because if not, you might not know that Tower of Babel is about GIANT SPIDER MONSTERS.